There's a lot of cooking going on in my kitchen these days, but most of it is still in the development stages so I haven't had much to write about. I am hoping that will change soon and I can get to posting again. Pasta is one of those things. I have been experimenting with a new recipe that I think I might actually like better than this one that I have been previously using. The main difference is that this new recipe has oil in it, and few people will disagree that a little bit of fat adds a whole bunch of flavor. It also gives the dough an elasticity that I haven't been getting with the original recipe. I've only made it a couple of times, though, so the verdict is still officially out, even though I'm pretty sure this one will win. I'll keep you posted. There's an unforeseen benefit that comes with making your own pasta, I have discovered, especially when making shaped pastas that require trimming an oval into a square. I got in the habit of slicing any leftover edges into noodle-sized pieces and freezing them for the occasional soup or quick side dish. That is what I did here. I had a sandwich bag full of frozen scraps and a napa cabbage. I needed a side dish for a Chamorro chicken recipe on which I have also been working. What to do? I have been working on another dish I recently discovered, a Hungarian dish called Haluska, which is a cabbage and noodle dish that is quite tasty and about which I also hope to write soon. 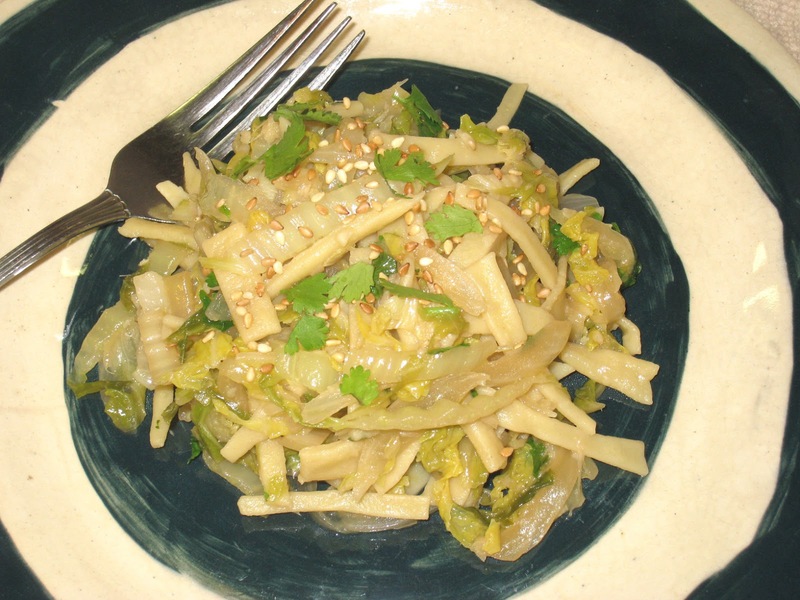 I had the cabbage and the noodles; I just needed to give them an Asian twist. The result was quite delicious, and easy to make. I took the basic recipe, which is simplicity itself, and added ginger/garlic paste, a little white wine and sesame oil, then garnished it with sesame seeds and fresh cilantro (for some much-needed color). It was particularly good with the chicken. Heat oil in large skillet over medium. Add onion and cabbage and cook, stirring frequently, until the onion is translucent, adding more oil as needed. Stir in the wine. Lower the heat, cover, and simmer for 20 to 30 minutes, until the cabbage is tender. Add the cooked noodles and stir to combine well. Let cook for another minute or two, then season to taste with the salt and pepper and add the sesame oil. Stir to combine and serve garnished with the sesame seeds and cilantro.